This may not be true in your Christian circles, but I tend to hear about popcorn. Perhaps it reveals a suppressed hankering from those who miss going to the cinema because they have overloaded the schedule with church activities. But what does popcorn have to do with Christianity? Is this a critique of junk food Christian diets that fill us up but offer no nutrition? Not this post. Is this advocating a prayer meeting strategy that avoids the elongated prayers that stifle the spontaneity of a group? Again, not this time. My wife will make popcorn as a treat for the family. It’s simple really – kernels are placed into hot oiled pan, the temperature rises, then suddenly they start popping. Quick, easy snack. But not every kernel will pop. Some become teeth breakers. 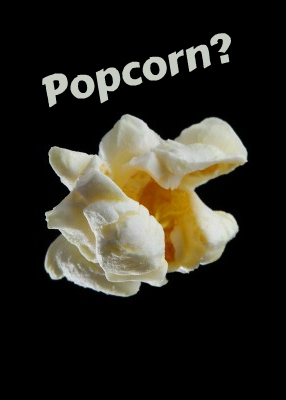 The heat boils the moisture within until the kernel explodes and is transformed from the inside out. Some only solidify. Here’s what I was pondering after a discussion we had in Cor Deo last week. Take two people – perhaps the same age, same nationality, same time period. Put them into the heated environment of a season with Jesus. Same experiences, same Christ, same circumstances. Watch one of them explode from the inside out with delight in Christ. Watch the other grow harder still. From these snippets you wouldn’t hold out much hope for John. Would this guy ever grasp the radical upside-down nature of Christ’s kingdom? Would he accept that it is not about force, but about a power completely different than he’d experienced in this world? Then there is Judas Iscariot. It is hard to see him without thinking of the end of the story. But we have to remember that the others did not spot his traitor-traits during their years together. He must have seemed trustworthy. The one carrying the group expenses and keeping track of receipts. But the heat of Christ’s graciousness toward these men just kept getting hotter. It all unraveled for Judas in John 12 and 13. There the extravagant love of Mary for Jesus really wound him up. This much money should have been reserved for the, uh, poor! Then Jesus headed into the city, but not to establish a power-based coup overthrowing occupying forces. No, the next thing we know Jesus is clad in a towel and washing the disciples feet. This is the kind of love that warms our hearts and can transform us from the inside out. I suspect it did with John. After all, decades later he cannot help but write in detail of this moment in his experience of Christ. He had been the one reclining closest to Jesus. He was the one informed of the betrayer. And in that moment the heat got too much for Judas. The love must have been driving him mad! Money wasted, and now this humiliating display of affection. It was too much – it was as if he couldn’t find the oxygen he needed, the oxygen of his worldview was missing, and Judas was choked out of there. God’s grace does that. Some have hearts that explode, transforming a life from the inside out. Others get baked into teeth-breaking solidity toward God. Same “raw materials,” but the heat has an equal and opposite effect. I suspect the same thing happens today. I am convinced that introducing Jesus and the grace of God into a church will not be universally accepted. The heat will turn some inside-out, while others will resent the emphasis and become hardened. Jesus was always controversial. And lest we start looking at others and wondering, let’s fix our eyes on the Lord and ask Him to search us and know us. I’m sure your prayer, like mine, is that we will be responsive to God’s love in Christ. Surely nobody wants to be the tooth breaker at the bottom of the bowl? Thanks for this Peter – very helpful, and very challenging too!